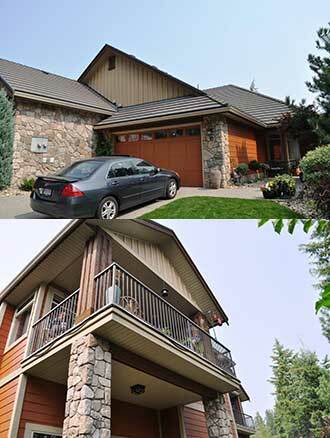 With 29 years of commitment to our customers, Pro-Painter has successfully completed hundreds of decorating projects for the Central Okanagan Strata Community. Whether it be line painting in underground parkades, painting the perimeter fence to the complex, or completing a 160 Unit Townhouse Development, Pro-Painters offer peace of mind to Unit Owners when transforming their property with seamless execution and care. Offering quality control monitoring for complete customer satisfaction – guaranteed! We understand that coordinating an exterior re-decorating project of multiple units may seem overwhelming to the unit owners. Let Pro-Painters take the wheel and get you to that final stage with minimal disruption, a clean and safe jobsite and always a friendly attitude. When setting the budget for the year, let us be involved with preparing an achievable scope of work that focuses on the quantity without sacrificing on the quality. "I am President of the strata council for Ledgeview Strata, a 14 unit strata complex in Kelowna's Wilden development. We recently hired Pro Painters to do some work on our units. This was not a simple job, as what we wanted was to only re-paint the areas that needed it, and not the entire strata. Pro Painters were very obliging, walking through the complex with myself and a couple of other council members and deciding what needed paining and what did not. They did an excellent job, at a very reasonable price. We were very pleased and will certainly use them again for any painting that we require." 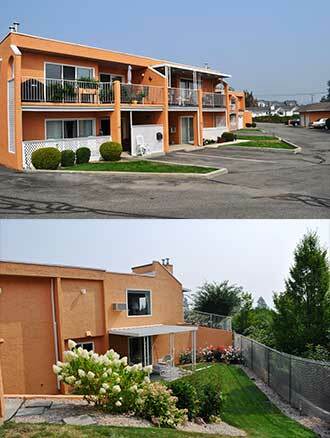 "We found the team of painters very professional, polite and considerate of the owners in our complex. They were always punctual, provided quality work, completed the work in the estimated time frame and cleaned up after themselves at the end of each day. We would definitely recommend them for any future projects." Pro-Painters …You’ll love our work. We guarantee it.